a familiar sight that will soon not be seen again. 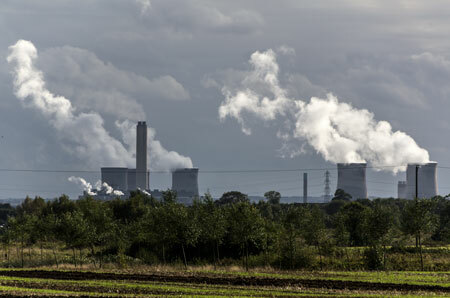 For more than 40 years, the 6 giant cooling towers and the 200m stack of the 2GW Didcot ‘A’ coal-fired Power Station have been a familiar sight on Radley’s southern skyline. RWE npower, the station’s operators, have announced that, at the end of March 2013, the station will finally cease generation and close. It has been known since 2004, when the power station opted out of the European Large Combustion Plant Directive (LCPD, 2001/80/EC) that it would definitely have to close by the end of 2015, or after 20,000 hours of operation after midnight on 31 December 2007, whichever came first. The LCPD is European legislation aimed at reducing emissions from old fossil-fuel-burning power stations. In 2004 the operators of such stations were given the choice, either to upgrade the plants to meet the emissions standards set by the legislation by 1 January 2008, or close them down completely. In the case of Didcot ‘A’, RWE npower opted for the latter. The station’s imminent closure should therefore come as no surprise. The station’s operators have indicated that the 20,000 hours of permitted operation will run out by the end of March next year. However the decision may have been precipitated by changes to the Climate Change Levy, through the introduction of a Carbon price floor, on 1st April 2013. This effectively raises the price of the coal burnt by the power station and it is likely that this would have made continued operation of an old low efficiency power station like Didcot ‘A’ unprofitable. Following closure, decommissioning of the station will commence immediately and proceed to complete demolition within a few years. Part of the site is likely to be retained for future power generation and, of course, the existing 1.4GW gas-fired Didcot ‘B’ station will remain. It is unlikely that a new coal-fired station will ever be built there, and, as the site is totally unsuitable for nuclear, the only option in the near term would be gas. Modern gas fired stations have a very small footprint, which means that much of the site will become available for redevelopment, though no decisions on what this should be have been taken. Didcot A’s operations have not been without controversy for Radley, first with the decision in 1982 to import waste ash from the power station to fill in gravel pits in the parish, and the four year battle, during 2005-2008, to save the last remaining Radley Lakes from the same fate. Having reached its allocated 20,000 hours of operation, the power station was finally disconnected from the grid today at 14:00 (the technical term is “desynchronised”). The closure marks the end of 42.5 years of power generation, since the station was first synchronised on 30 September 1970. At the end of the month, decommissioning will begin, leading eventually to the demolition of the structure, including the iconic towers and stack. The process is expected to take several years.